EIGHT people were injured and four of them were hospitalised after they were attacked by machete-wielding artisanal miners in Esigodini during a three-day gold war that saw two alleged gold barons being arrested.The battle over gold claims has left many injured and some dead in the past five years. Two alleged gold barons and more than 20 suspects were arrested over the latest attacks. 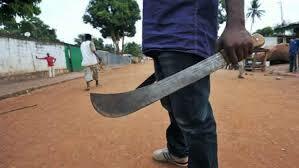 Residents say three notorious gang leaders operate in the area controlling about 200 men each. Esigodini residents had to endure over 48 hours of terror as rival gangs fought in Habane Extension suburb on Wednesday, Thursday and yesterday, damaging cars, stoning houses and beating up people. Matabeleland South police spokesperson Inspector Philisani Ndebele confirmed the incident. “We are dealing with a case of public violence where four people were hospitalised after being attacked. They sustained varying degrees of injuries. We have arrested some of the suspects and are appealing to members of the public to assist us to round up the rest of the suspects,” said Insp Ndebele. Four people who have been admitted to the United Bulawayo Hospitals have been identified as Ayanda Mpofu, Dereck Dube, Mayibongwe Ncube and Busani Magutshwa. The other four who were injured were rushed to Esigodini clinic where they were treated and discharged. Two suspected gold barons, Sifelani Chinguru and Busani Magutshwa, appeared before Esigodini Magistrate Tawanda Muchemwa charged with public violence. They were not asked to plead and remanded in custody to Thursday next week. According to court documents, Chinguru (40) and Magutshwa (37) are ring leaders of the ‘MaNkayi’ and ‘MaGokwe’ gangs who are known rivals in the area. Insp Ndebele said gangsterism must fall as it has created a lot of problems in the area. The Officer Commanding Gwanda District, Chief Superintendent Enoch Sibanda, in an interview after a residents meeting in Esigodini, said the police were not taking the violence lightly. “We will plead with the courts that people engaging in these gang wars and wreaking havoc be given hefty sentences because innocent people are suffering. This must stop and it must stop now. People must learn to live together peacefully and all the turf wars must come to an end,” he said. When The Chronicle arrived in Habane Extension suburb, some of the “Gokwe gang members” were at a house smoking and drinking after terrorising residents at Muramba shops in the area. Gold wars have bedevilled Esigodini for years and the perennial problem seems to be getting worse. In September last year, police officers fled and left behind a cuffed suspect at Habane Business Centre after they were attacked by an armed gang of suspected artisanal miners. Earlier in 2017, an Esigodini gold baron shot a man who was part of a nine-man gang armed with axes, machetes, spears and knives that allegedly attempted to attack him. In November 2016, an alleged ringleader of one of the gangs of gold panners was hospitalised after his right foot was chopped off in a fight over a mining claim in Filabusi.